Alexandra and Adrian were married on the 19th October 2017 with a reception being held at The Vines for 20 family and friends. Wedding Cake was to be served as main dessert. 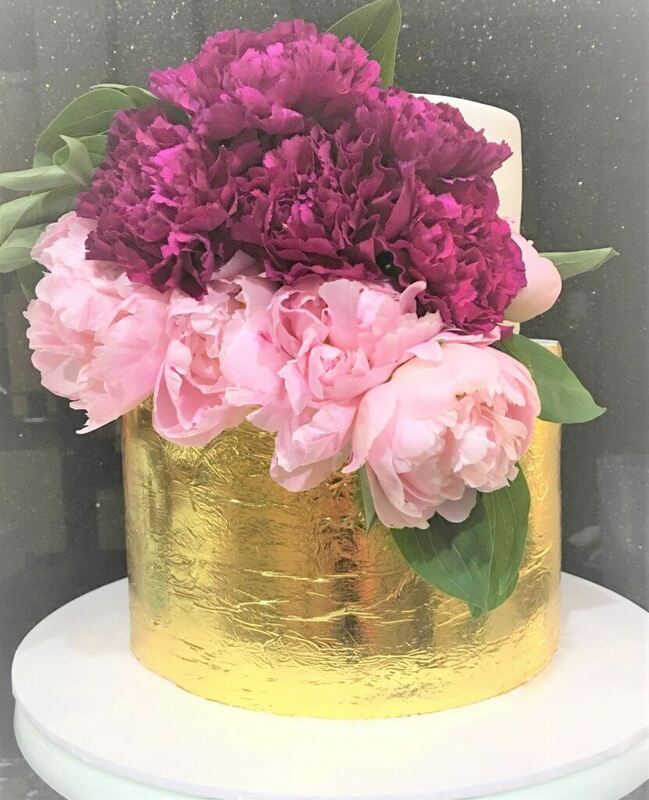 Bottom Tier: White Chocolate Mud Cake covered with white fondant and then Gold Leaf placed around entire tier to give the effect of a rough but very effective finish. You can see our selection of flavours by clicking here. Top Tier: Dark Chocolate Mud, covered in white fondant and finished off with beautiful fresh flowers. Wedding Cake was assembled the morning of wedding and delivered to reception location as is, cake was then displayed on a solid timber cake stand, which kept in with the rustic theme of their wedding. A lovely wedding in a beautiful location, with a simple but stunning wedding cake, with the gold leaf and fresh flowers a beautiful mix. Thank you Alexandria & Adrian for choosing Rimma’s Wedding Cakes and we wish you all the happiness in your new lives together.